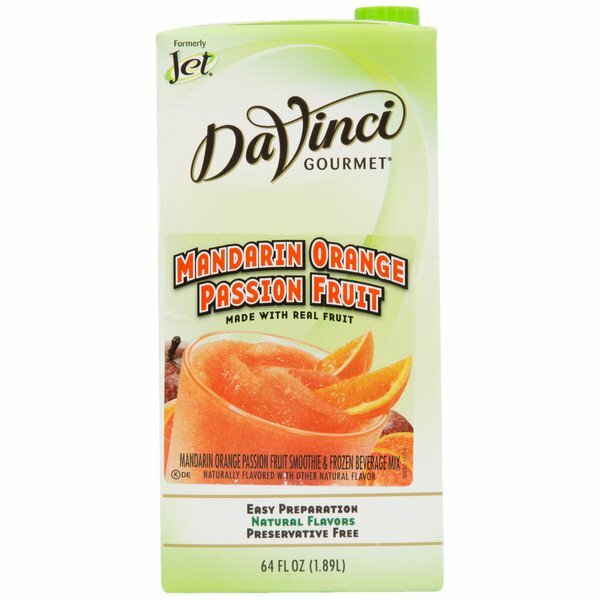 Quickly and easily whip up serving after serving of delicious fruit smoothies with this DaVinci Gourmet mandarin orange passion fruit real fruit puree smoothie mix! This mix really packs a punch of refreshing mandarin orange and passion fruit flavors for your most popular blended drinks. Tart, sweet and naturally-derived, this mandarin orange passion fruit smoothie and frozen beverage mix is free of preservatives and easy to prepare. Simply mix 2 parts ice with 1 part smoothie mix to begin crafting your smooth, blended cocktails or icy and refreshing granitas. DaVinci Gourmet offers premium smoothie mixes in a variety of flavors to meet all of your drink recipe needs, including margaritas, daiquiris, and more! This mandarin orange passion fruit flavor adds a citrusy, exotic note to your drinks. Stock your bar, coffee shop, smoothie shop, or cafe with this smoothie mix and enhance your drink menu with new, flavorful items! 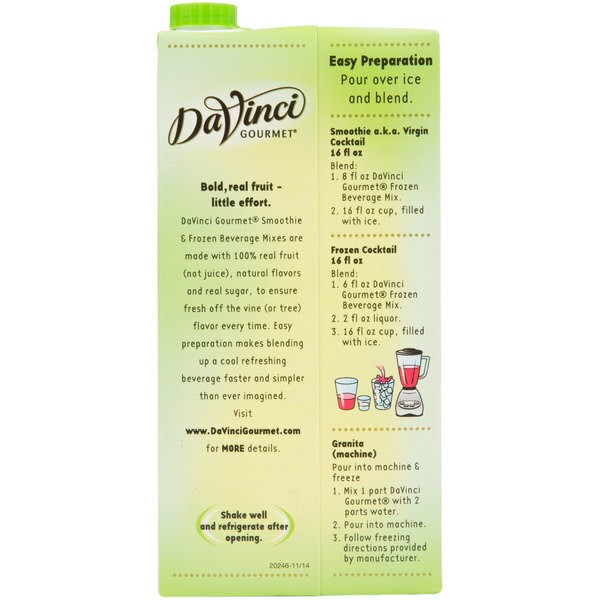 DaVinci Gourmet real fruit puree smoothie mix is packaged in a 64 oz. carton that is easy to store in your busy kitchen or bar, with a resealable cap that keeps any unused product fresh. Refrigerate after opening. We add this to our fresh squeezed lemonade at events during our summer season. This is my personal favorite flavor! It pairs perfectly with lemonade on a hot summer's day! DaVinci Gourmet 64 oz. Mandarin Orange Passion Fruit Real Fruit Smoothie Mix tastes great and no fake taste. I mix this with coconut water for a light and refreshing smoothie or sometimes use almond milk to add a little creaminess. A nice and complex set of flavors in this smoothie mix by DaVinci. The Mandarin Orange Passion Fruit smoothie mix is great. The flavors compliment each other perfectly and make for a wonderful smoothie. This makes a delicious smoothie - I especially like to use it as a base and add extra fruit to it. The kids love it, and the flavor is out of this world. 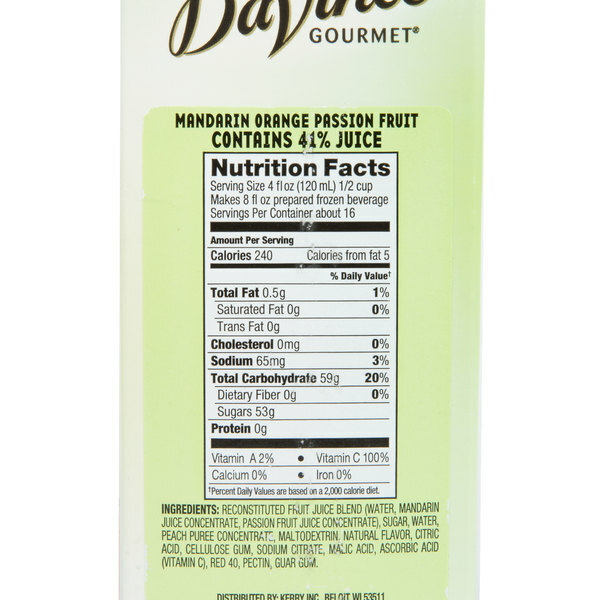 The DaVinci gourmet mandarin orange passion fruit real mix is awesome. Tastes really good. Love the citrus appeal and almost reminds me of an orange Julius. The Mandarin orange passion fruit smoothie mix is a great tropical combination. The flavors are great and fresh and tastes really well together. A great, unique option for our beverage stand. The DaVinci Mandarin Orange Passion is a beautiful red-ish orange color bursting with flavors. Its really easy to make, just fill a cup up with ice and pour the mix over the top, Then blend and serve! The combination of flavors in this smoothie mix is great. The mandarin orange is smooth and citrusy and the passion fruit is sweet. The mix is a new one for us but we love it. Best option on the market for orange type of smoothie mixes. Have tried other orange purees before but this one gives the most authentic flavour to your shakes and smoothies. 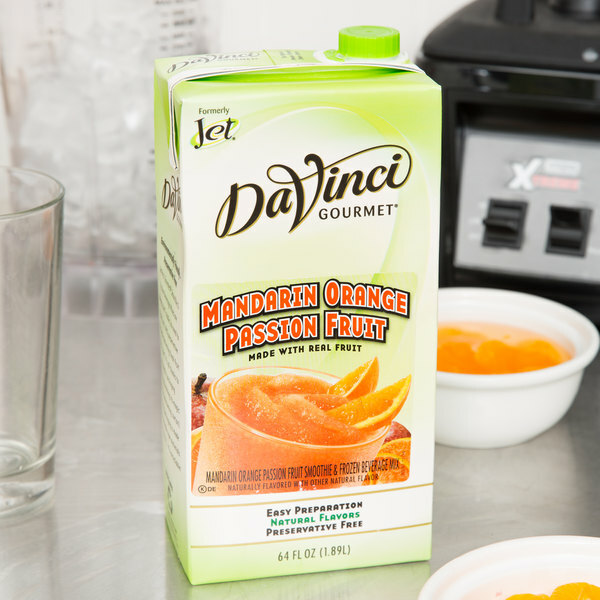 We handed out samples of the Mandarin Orange Passion Fruit Smoothies the first day we had it. Half of the visitors and staff who tried it came in to order one. Since then it has been on our menu and a favorite due to the tangy orange flavor infused with the sweetness of a smoothie. Really great flavor. Turns out more like an icy than a smoothie which is what we were going for. Fun color and refreshing drink. People like the unique option. Love this great delicious quick fruit drink. Mandarin Orange real fruit smoothie mix drink is so simple to make. It is so good to drink! We just bought this to try two weeks ago and already it is becoming a fan favorite. The color and aroma themselves are enough to entice people. Easy to make - simply add ice and blend. Kids love the Jet mix. It does contain caffeine (because of the green tea). Good shelf life. Kids seem to enjoy cherry and strawberry/strawberry banana the best. I recently purchased a Ninja blender and was looking for smoothie mixes. When I lived in Washington, I used to stop by a coffee stand that sold Jet products. I knew the quality was great. I can make my own smoothies at a fraction of the cost. Mandarin Orange Passion Fruit is an awesome combination. I highly recommend. My customer loves the Mandrain Orange Passion Fruit Smoothie and the Kids love it to. We have to buy this flavor by the case because it is like so well.